Gauhar Jan, Peara Sahab, Ustad Kale Khan, Master Dinanath Mangeshkar, Ustad Rahimat Khan, Phiroz Dastur, Pt. Krishna Rao Pandit , Kesarbai Kerkar, Ustad Amir Khan, Ustad Bade Ghulam Ali Khan, Pt. Bhimsen Joshi, Ustad Nissar Hussain Khan, Pt. Kumar Gandharva, Pt. Jasraj, Ustad Barkat Ali Khan, Kishori Amonkar, Pt. Ajoy Chakravarty, Pt. Jitendra Abhisheki, Ustad Rashid Khan, Kalapini Komkali, Meeta Pandit & Many more. Saregama is proud to present this premium pact of 14 CDs that is a labor of respect and adulation. Comprising of vocal music spread over 108 years. The next step was to then select the 100 artistes featured herein over 135 tracks, their Gharanas their Gayakis and the Guru Shishya Parampara imbibed by them. This pack gives connoisseurs a glimpse of the creativity of performing artistes their methodologies their thinking patterns and how & why their signature styles also been artistes of repute with a prowess of their own. Thus this pack also highlights the significance of perceptive teamwork. The pack catalogues various Ragas the recording processes on different formats from 78 rpm recordings to extended play recordings to long play recording to cassettes and then to compact Disc recordings and is thus also a documentation of technology. 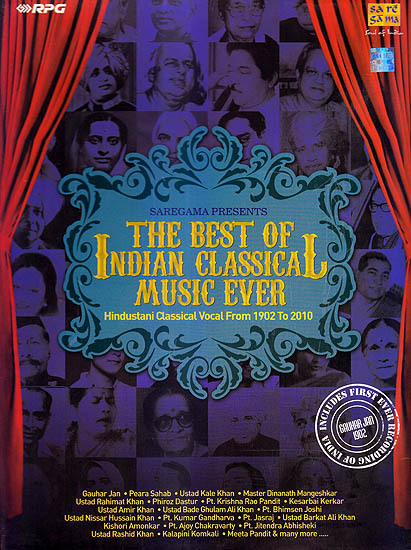 This set of 14 CDs Shall from remain as a classic reference material not just for artistes ragas or jod ragas or ragas emphasizing the time factor (based on the 8 Prahars), this pack has it all. The various shades of Semi Classical music have also been painted on this historic canvas through renditions of Thumri, Dadra, Kajri, Chaiti, Bhajans, etc. the age old legacy of traditional Gharanas be it the Agra Gharana, Kirana Gharna, Gwalior Gharana, Mewati Gharana, Indore Gharana, Banaras Gharana, Jaipur Gharana, Patiala Gharana and many other this pack emanated as essence of each. The repertoire in these 14 CDs is rich and yet succinct incorporating the work spread over nearly 11 decades is no easy task. Further selecting parameters for a bifurcation was equally formidable. Thus having studied closely their repertoire we have compressed into 4 CDs the work of artistes spread over five decades (1902-1950). There are 2 CDs each for the 2 decades between 195101960 and 2001-2010. Although we at Saregama have done our best to Showcase the works of as many legendary vocalists as possible there have been some who have not been featured herein purely due to constraints at our end.